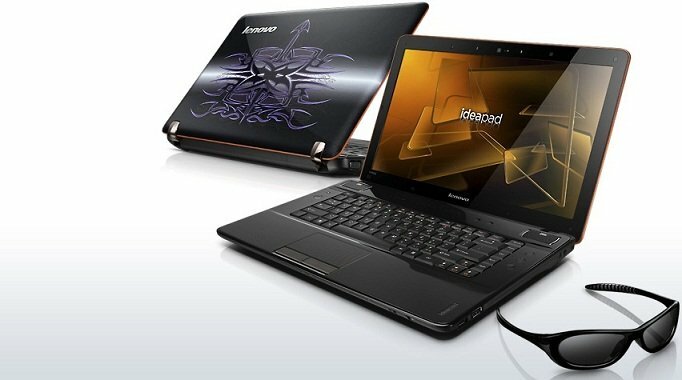 During the middle of June, Lenovo announced its first 3D laptop, the IdeaPad Y560d. Today the Y560d is now available through the Lenovo website with a starting sale price of $1,499.00, which could change when or if it hits retail stores. This is a pre-configured system, with no available options to upgrade except for Warranty and Accessories. It is also not said if the 3D glasses come included or whether you will need to purchase a pair separately, but I have contacted Lenovo and waiting on a response. Available software to enhance the 3D experience includes, TriDef Media Player, TriDef Photo Transformer and OneKey Theater II for On Demand and Optimized Video and Audio playback with the press of a button. There are a few changes from the announced specs and pricing for the laptop. Lenovo announced the pricing for the laptop at “approximately $1,199.99”, available memory options would be up to 8GB, there would be an optional Blue Ray player and up to 750 GB Hard Drive. Hopefully these will become available as sells start to pour in. Looking to order one? Head over to the Lenovo IdeaPad Y560d Order page.